Asahi Akai Doa landed at Karangahape Road's Las Vegas Club last August. 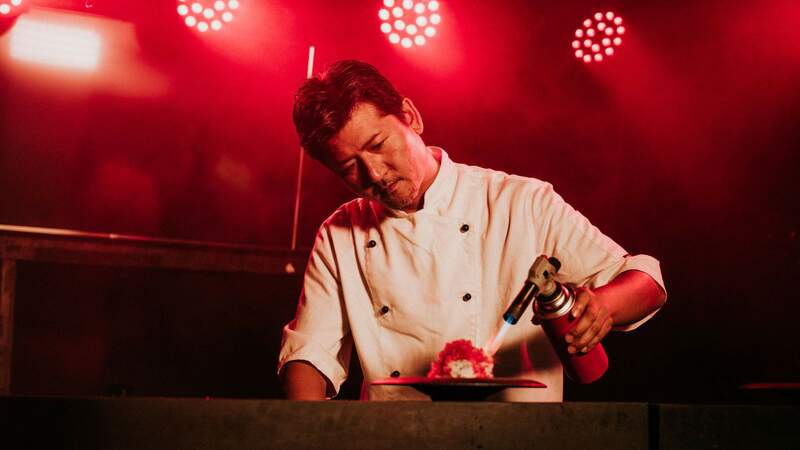 The pop-up dining experience, which translates to 'red door', saw esteemed chef Yukio Ozeki present a tasting menu under the decision-less dining style of omakase — a Japanese tradition which literally means 'I'll leave it up to you'. The red door will open for a second time this April, promising a theatrical dining experience. Chef Yukio has created a brand new six-course menu for the occasion. With local produce and using a fusion of traditional and Japanese techniques, Ozeki's menu will require an open appetite and no pesky dietary requirements. Diners can expect an extra dose of theatricals to complete the experience, including a Tokyo-inspired lighting installation created by Angus Muir, fashion shows from local label Stolen Girlfriends Club and a dining collaboration with Culprit. Akai Doa Late will see a collective of DJs transform the restaurant into a revelrous cocktail lounge every Friday and Saturday. Asahi Akai Aoa will officially open on Thursday, 11 April and will operate every Thursday, Friday and Saturday until 11 July. For those who can't wait for the pop-up to open, Asahi is providing Aucklanders with a sneak preview in front of Las Vegas Club. From April 4 to 6, 12-2pm, Chef Yukio will serve a sample of the new six-course menu to passers-by. The joins 'fukubukuro' street poster portals dotted around the CBD and Ponsonby, containing gifts from Stolen Girlfriends Club, Asics and Akai Doa.